Blast off to a new a level of clean with the all new Chemical Guys Red Rocket Brush! This innovative, never-before-seen design allows you to clean even the hardest to reach areas with a simple bending of the brush. 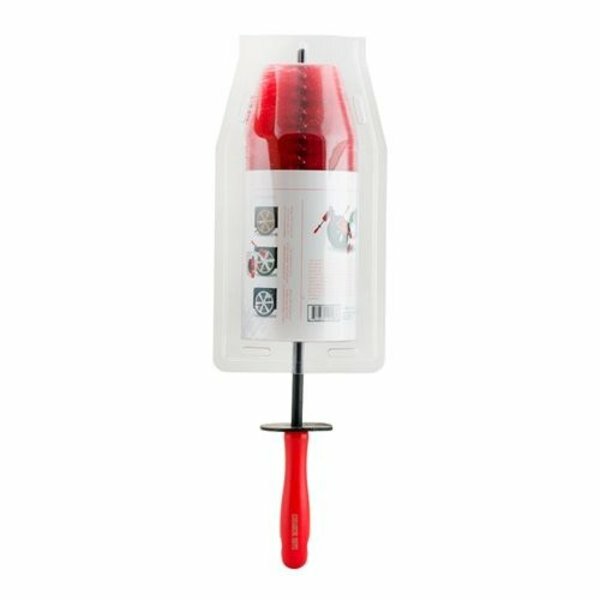 The rubber wrapped metal spine allows the brush to twist and contort to any shape and angle your wheel requires, without scratching the sensitive finish. Use all 9” of the soft bristled brush to effortlessly scrub around brake calipers, inner wheel rims, and behind wheel spokes. Don 't need the angle? Simply keep the spine straight and use as a regular wheel brush for maximum penetrating action. No two wheels are the same, but now there 's a single brush to clean them all with the Chemical Guys Red Rocket Brush! This innovative brush features a unique flexible spine that allows you to clean even the toughest and most inconvenient areas quickly and easily. Bend the brush to a 90 degree angle to clean the back of your wheels and say sayonara to even the most hidden and caked-on dirt. 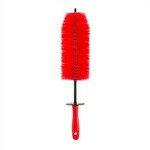 The Red Rocket Brush is so thorough that it will clean dirt that you didn 't even know was there! Simply bend the brush, insert into your wheel, and watch filthy brown water stream down from seemingly clean wheels. Even though you can 't see it, when left untreated, hidden brake dust and debris can damage your wheel from the inside out. 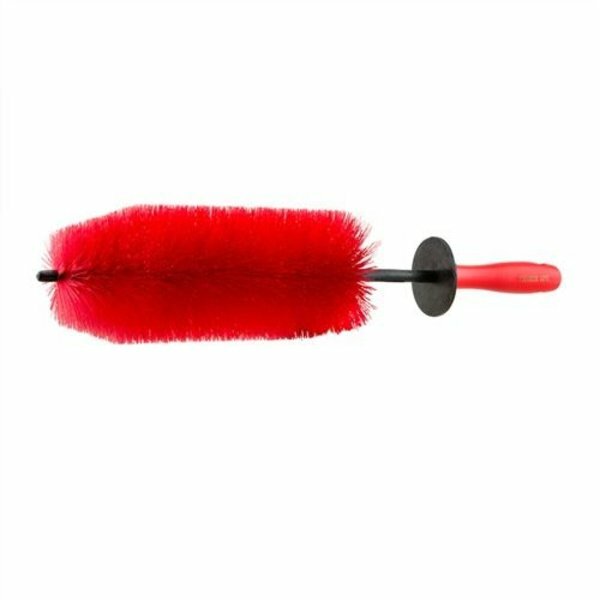 A detailing brush that can bend to whatever shape you need, the Red Rocket Brush effortlessly scrubs around brake calipers, inner wheel rims, and behind wheel spokes for ultimate detailing versatility. The sturdy construction of the twisted metal spine means that once the brush is bent to the desired angle, it won 't bend back until you want it to. 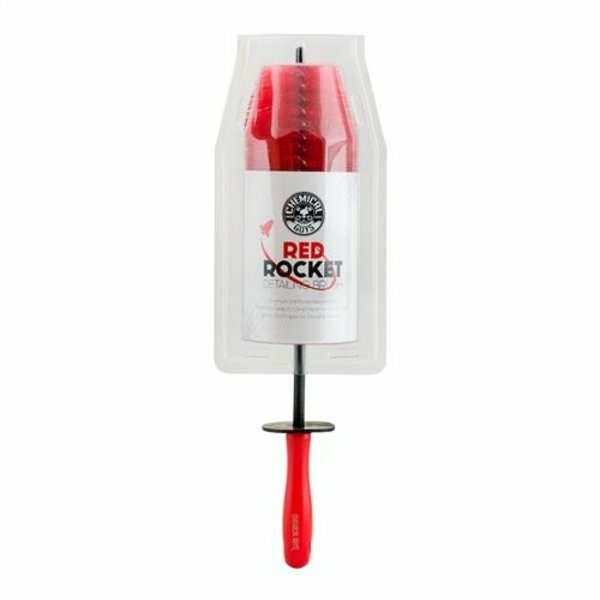 There 's nothing more frustrating and having an “adjustable” product that just won 't stay put, so we developed the Red Rocket with quality materials so it will do what you want, when you want. Your wheels have it hard enough as it is, so don 't add to the abuse by using harsh and ill-designed detailing tools. The Chemical Guys Red Rocket Brush cleans even the most sensitive wheels without scratching or damaging the finish. 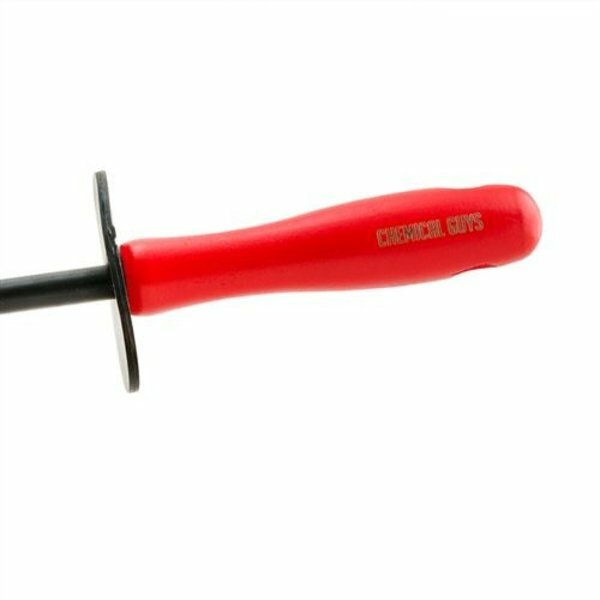 The rubber tip ensures that when inserting the brush inside the innermost crevices of even the deepest dish wheels, your wheels will always be protected from any abrasive contact. 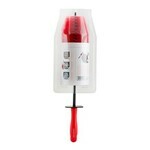 Like a true rocket, the tapered nose of this brush allows it to penetrate into deep crevices effortlessly. The rubber wrapped spine allows you to reach deep inside the barrel without ever having metal to metal contact in order to minimize the chance of scratching your wheels. The soft bristles of the brush are sensitive enough for any painted or polished metal wheel, yet durable and destined to become a long term staple in your car care arsenal. Detailing doesn 't stop when your car is clean, it continues until every tool is picked up, cleaned, and put back in its proper spot. The red color of the bristles not only allows you to see the dirt you pick up off your wheels, it also makes cleaning the brush easier so you can see when all the filth is washed out. The drilled hole in the handle allows the brush be hung to dry and for easy storage next the rest of your Chemical Guys tools! Detailing your wheels isn 't only difficult, it can also be dangerous! We have all skinned our knuckles, cut our hands, or unintentionally hurt ourselves by making contact with the hard and often sharp wheel spokes. 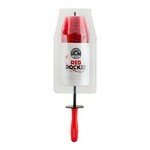 Having experienced all these injuries ourselves, we designed the Red Rocket Brush with the detailer in mind. The rubber knuckle guard at the top of the handle protects your hand from accidental bumps and bruises when getting down and dirty with those filthy wheels. The wood handle lends the brush an overall light weight that makes the brush easy to hold, use, and manage. Less quality plastic brushes not only feel cheap, they bend and break after just a few uses. The Chemical Guys Red Rocket Detailing Brush is made of wood, metal, and rubber, ensuring that it will survive through even the toughest details and become your go-to wheel brush. With the Red Rocket Brush, cleaning your wheels is no longer a chore. Don 't just take our word for it, let the Chemical Guys Red Rocket Brush launch your car to a new level of clean today! First rinse away loose contamination and spray the face and barrel down with your favorite Chemical Guys wheel cleaner.